A family organized a whole trip around one meal in Modena, Italy. Was it worth it? Emilia Romagna is Italy’s gastronomic heartland. Ever since our children were adult enough to qualify as foodies, we’ve traveled each summer to a place with great cuisine and enough culture to keep us busy between meals. This year, our family of six and a few friends made a pilgrimage to Osteria Francescana, the 2016 “World’s Best Restaurant,” in Modena, Italy. We’d never organized the trip around a single meal before, but my husband was having a big birthday in June, and it seemed the perfect way to celebrate. Besides, Modena is in Emilia Romagna — Italy’s gastronomic heartland — a region we’d always meant to visit but one we tourists routinely overlook, according to our guidebooks. How curious, especially now that so many of us are traveling on our stomachs, since Emilia Romagna is said to have the very best food in all of Italy. It produces many of the cuisine’s essential ingredients: wheat for the best pasta, prosciutto and mortadella, and the only legally designated Parmesan and Balsamic vinegar. Plus, besides being rich in art and architecture, it’s very affordable. The region sounded like a gustatory paradise, hidden in plain sight as if by a spell. It sounded, in fact, too good to be true. Day 1, we headed to nearby Vignoli, for the little town’s one-day, annual cherry festival, an event so local, our house manager was unaware of it. Filling Vignoli’s central, shaded, cobblestone avenue were proud displays of each farm’s cherry crop, from pale pink to ruby red, sweet or less so, thin or thick skinned — mind-blowing to those used to only one supermarket variety. And then there were the booths selling farmhouse cheeses, fresh baked goods, cherry jams and liqueurs. If there were other tourists, we didn’t see them. On to Bologna, where we strolled some of the 22 miles of colonnaded streets, explored the historic center, and gawked at the phantasmagoria of pasta, parmesan, and produce in the city’s oldest market. A large billboard advertising “FICO Eataly World” sat in the main square. Whatever that was, it didn’t open until November, so we ignored it. Day 2, we spent in Parma, with its flamboyantly frescoed, medieval cathedral, topped with an eye-popping, trompe-l’oeil Assumption of the Virgin, in its dome. We had a virtuously light lunch, because we were saving ourselves for dinner at La Buca, in tiny Zibello. This family trattoria is renown for its succession of female chefs and its house-made culatello, the locale’s cult-status prosciutto. The current chef — a son-in-law! — welcomed us into our own little dining room, where we were served family style and encouraged to order as the meal progressed. Charmed and stuffed, we finished the evening in the cold storage cantina behind the kitchen, where the entire ceiling was hung with the precious hams and the chef explained the centuries-old curing process. La Buca is well known — The New Yorker had a piece on it — but that night, astonishingly, we were the only diners. Day 3 began with a tour of Modena’s world famous vinegar production at the small, family-owned Il Borgo del Balsamico. In the attic of an ancient manor house, our personal guide explained how pressed grape must (juice along with skin, seeds, and stems) is slowly reduced and moved to ever smaller casks of different woods for at least 12 years. We were surprised to see a boutique product made in such a modest space, but apparently nearly every attic in the region has its own for-home-use production. Off to our lunch reservation at the Giusti salumeria in Modena, for its single daily seating in the little upstairs dining room. Passing through the kitchen and climbing the steps to what felt like a secret hideaway was as exciting as the meal itself. Although recently featured on the popular TV series, “Master of None,” we’d had no trouble booking one of the deli’s 6 tables. 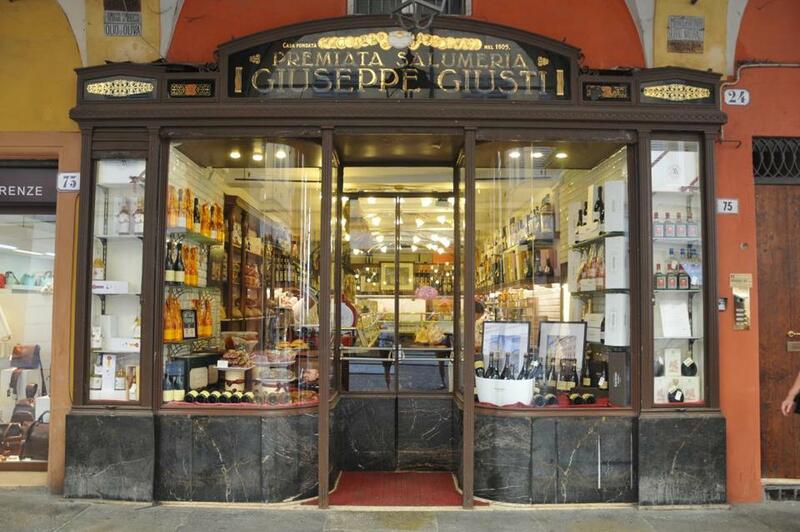 Premiata Salumeria: Giuseppe Giusti in Modena. Every day brought new discoveries: a visit to Salsamaggiori, the Hollywood-style, art-nouveau spa; a dessert of Parmesan tastings — variously aged and from cows grazed at different altitudes; a tour of Verdi’s ancestral town and its violin museum. And what of our destination dinner? It turned out be the exact opposite of every other meal on the trip — from the booking on. Miraculously, our children had managed to secure one of the 12 tables by signing onto the restaurant’s website from four different devices at 4 a.m. on March 1, the designated instant for a June reservation. Arriving 10 minutes early, we waited unceremoniously in the street with the other international diners. The dining experience itself was about tasting rather than eating, about brilliant innovation, about food as metaphor, as performance, as art. To wit: the chef’s “signature” dessert re-creates an actual kitchen disaster: a dropped lemon tart. Its visual effect is astonishing — with the tart convincingly splattered on what appears to be a broken plate — but the taste is unaffected by all that effort. Whatever. The meal was unforgettable — and brought us to Emilia Romagna. And just in time. Back home, we learned the meaning of the billboard in Bologna: FICO Eataly World is Mario’s Battali’s culinary theme park, which opened this fall outside the city and hopes to attract 10 million visitors a year. The “single best thing” the New York Times reviewer tasted in the million square foot park? The culatello from tiny Zibello. If you’re inclined to visit Emilia Romagna, go soon, before the spell is broken. Elizabeth Marcus can be reached at erm82@aol.com.